Superhydrophobic surfaces are extremely technologically relevant in many fields. Examples include controlled drug delivery, anti-biofouling in medical devices, energy harvesting through hydrophobic nanoporous materials, anti-icing for preventing the freezing of aircraft wings, and drag-reduction to obtain high-performance marine vehicles with efficient fuel consumption. Superhydrophobicity stems from the presence of gas bubbles entrapped within the topography of the surface. These gas bubbles are stabilized against liquid pressure by surface tension; however, for high positive pressures the liquid can invade the gas bubbles, resulting in a complete wetting of the surface. Surface texture can also enhance vapour nucleation; thus for low liquid pressure (suction) a vapor bubble can cavitate. Both processes cause the loss of superhydrophobic properties. Thus, understanding how the stability of the gas bubbles depends on the geometry and chemistry of the surface can pave the way to developing design criteria for artificial submerged superhydrophobicity. Textured surfaces for underwater applications, in which turbulent flow conditions can cause very large positive and negative variations of pressure, requiring nanoscale structures to improve the stability of the entrapped air bubbles. In the recent article in Journal of Physics: Condensed Matter, we investigate the stability of the gas bubbles in a nanoscale T-shaped cavity with hydrophilic and hydrophobic chemistry, and different aspect ratios via molecular dynamics (MD) simulations. By slowly varying the liquid pressure, we perform an intrusion (up to very high positive liquid pressure) and extrusion (up to very low negative liquid pressure) experiment at isothermal conditions during which we monitor the filling/emptying of the cavity, i.e., we check the stability of the gas bubble against pressure variations. The extrusion cycle is also relevant to the recovery of superhydrophobicity, i.e. the process of emptying surface textures from liquid to recover the superhydrophobic state. 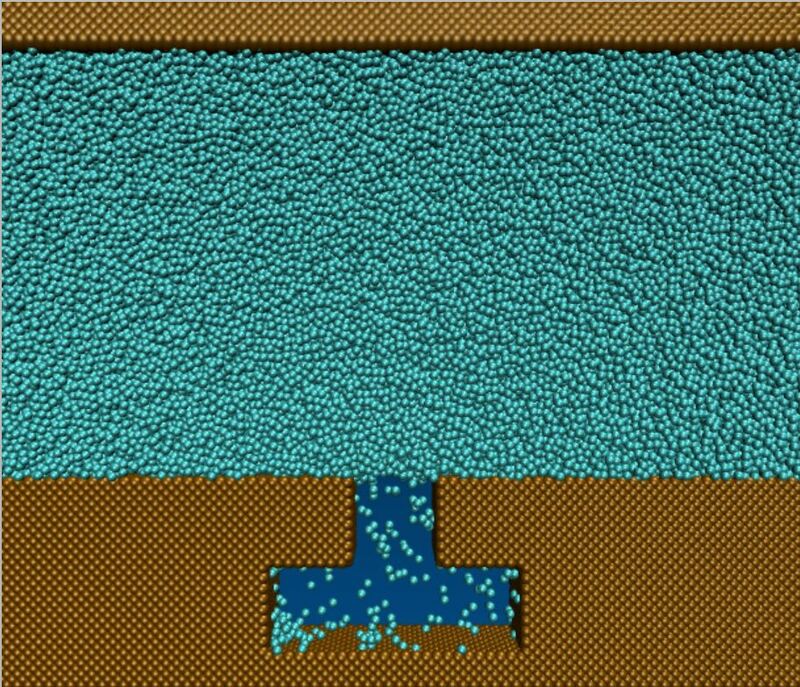 This is one of the key requirements of submerged superhydrophobic surfaces for technological applications. Beside intrusion/extrusion experiments we performed free energy calculations of the corresponding processes which allowed us to establish a connection between the chemical and topographical characteristics of the surface and the robustness of superhydrophobicity. Our results shed light on fundamental aspects of the physics of a three-phase solid/liquid/gas system in extreme confinement, which are crucial for the design of nanotextured surfaces with tailored stability to wetting/cavitation, and the facilitated recovery of superhydrophobicity. For more information read our open access article in Journal of Physics: Condensed Matter. Amabili Matteo is a PhD student in ”Applied and Theoretical Mechanics” at the University of Roma “La Sapienza”. His research focuses on the study of the stability of the submerged superhydrophobic state via rare-event molecular dynamics simulations. Alberto Giacomello is a researcher at the University of Roma “La Sapienza”. He received his PhD in ”Applied and Theoretical Mechanics” during which he studied the metastable states in the wetting of rough hydrophobic surfaces. Then, he held a PostDoc position at the Max Plank Institute for Intelligent System in Stuttgart in the group of Professor Dietrich studying contact angle hysteresis induced by nanodefects. Simone Meloni is researcher at the Department of Mechanical and Aerospace Engineering at the University of Roma “La Sapienza”. He works on applications of computational statistical mechanics to fundamental and technological problems, especially related to the energy technologies. He developed techniques for the simulation of rare events and non-equilibrium atomistic systems. Carlo Massimo Casciola is full professor of fluid dynamics at the Department of Mechanical and Aerospace Engineering at the University of Roma “La Sapienza”. He leads a research group of more than 20 people involved in several scientific fields: turbulent flows, combustion, micro and nano flows, and micro/nano scale physics of multiphase system.